The Voynich manuscript which dates from the Middle Ages is encoded in an obscure language that has long baffled linguists. Scholars had failed to decipher it. But in 2001, researcher Jim Finn felt that he had successfully cracked its linguistic code; see his archived webpage. The few pages he has deciphered appear to be referring to a cyclical terrestrial cataclysm brought about by a celestial “EYE.” As mentioned in Earth Under Fire, our Galaxy’s nuclear bulge would appear as a giant punishing luminous eye in the heavens during a Galactic core explosion. Ancient Egyptian myth describes mankind being punished by the Eye of Atum-Re (the Creator). In another myth it is the celestial Eye of Horus that brings destruction. Now Finn appears to have discovered the same metaphor appearing in a Middle Age scripture. 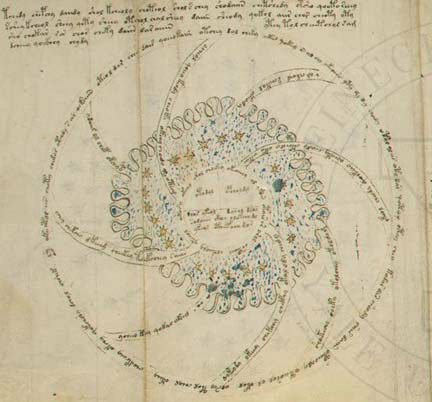 The pages of this manuscript are adorned with drawings, and curiously, one of these (see below) looks very much like a spiral arm map of the Milky Way, as seen looking down onto the Galactic plane from above. A Middle Age map of the Milky Way?